Today marks the beginning of Hanukkah for our Jewish friends, and while I'm not Jewish myself, I've long had more than a passing interest in Jewish thought and tradition. I was looking up the dates for Hanukkah this year a few weeks ago, and, as often happens when one begins web searching, found myself bouncing from page to page reading up on Hanukkah. 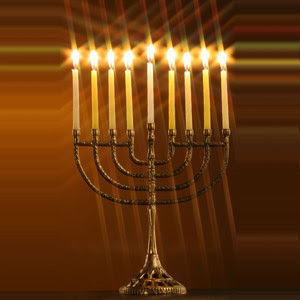 Hanukkah is occasionally known as the Festival of Lights, and it shares this theme of light in the darkness with, for example, the Christian holiday of Christmas and the Hindu festival of Diwali. And as we approach the darkest, longest night of the year, I've been thinking about some of the darkest, longest moments of the school year as well. Heaven knows we have them, of course. I'm continuing to struggle with one student who inexplicably, randomly hates me. Another student keeps coming to me with her romantic issues and I just want to tell her that her boyfriend is, to put it gently, not fit to be scum on the soles of her Jordans. The last three weeks have been intense with Regents right around the corner, students at their behavioral breaking points, curricular experiments not quite working, days on which you leave for work in the dark and come home in the dark...the list goes on. And yet there's light even in these dark moments. A student who has been flummoxed by English (both the language and the subject) for years has a breakthrough and writes a solid essay. Another student who had been treating school attendance as though it were somewhat optional starts showing up every day. These are small victories--small flickers of light in what can seem like a very vast darkness. But they are there, and worth celebrating, in this darkest week of the year. Still, I'm looking forward to having these upcoming eight days off. That is looming as a very bright light in the darkness indeed.